The Far East is a geographical term in English that usually refers to East Asia (including Northeast Asia), the Russian Far East (part of North Asia), and Southeast Asia. South Asia is sometimes also included for economic and cultural reasons. The term "Far East" came into use in European geopolitical discourse in the 12th century, denoting the Far East as the "farthest" of the three "easts", beyond the Near East and the Middle East. Likewise, in Qing Dynasty of the 19th and early 20th centuries the term "Tàixī (泰西)" – i.e. anything further west than the Arab world – was used to refer to the Western countries. 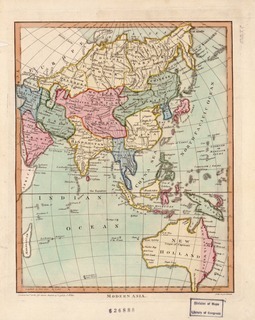 Prior to the colonial era, "Far East" referred to anything further east than the Middle East. In the 16th century, King John III of Portugal called India a "rich and interesting country in the Far East  (Extremo Oriente)." 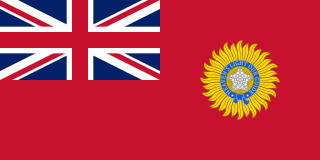 The term was popularized during the period of the British Empire as a blanket term for lands to the east of British India. 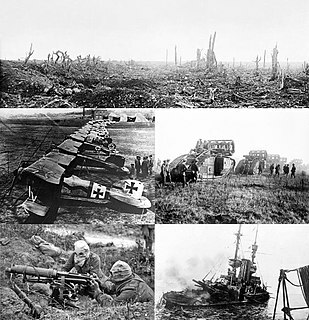 In pre-World War I European geopolitics, the Near East referred to the relatively nearby lands of the Ottoman Empire, the Middle East denoted northwestern South Asia and Central Asia, and the Far East meant countries along the western Pacific Ocean and eastern Indian Ocean. Many European languages have analogous terms, such as the French ( Extrême-Orient ), Spanish ( Extremo Oriente ), Portuguese ( Extremo Oriente ), German ( Ferner Osten ), Italian ( Estremo Oriente ), Polish ( Daleki Wschód ), Norwegian ( Det fjerne Østen ) and Dutch ( Verre Oosten ). The Near East is a geographical term that roughly encompasses a transcontinental region centered on Western Asia, Turkey, and Egypt. Despite having varying definitions within different academic circles, the term was originally applied to the maximum extent of the Ottoman Empire. The term has fallen into disuse in English and has been replaced by the terms Middle East, which includes Egypt, and West Asia, which includes the Transcaucasus. Sir Robert Gordon Menzies,, was an Australian politician who twice served as Prime Minister of Australia, in office from 1939 to 1941 and again from 1949 to 1966. He played a central role in the creation of the Liberal Party of Australia, defining its policies and its broad outreach. He is Australia's longest-serving prime minister, serving over 18 years in total. Far East in its usual sense is comparable to terms such as the Orient , which means East; the Eastern world ; or simply the East. 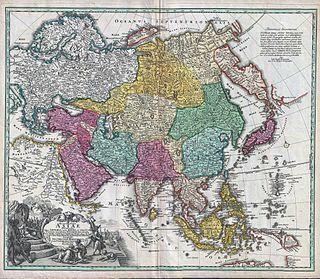 Southeast Asia, the Russian Far East, and occasionally the Indian Subcontinent might be included in the Far East to some extent. 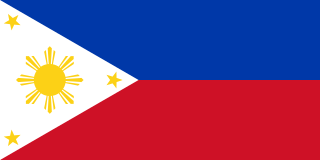 Today, the term remains in the names of some longstanding institutions, including the Far Eastern Federal University in Vladivostok, Far Eastern University in Manila, and the Far East University in South Korea. 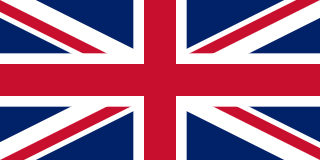 Furthermore, the United Kingdom and United States have historically used Far East for several military units and commands in the region; the Royal Navy's Far East Fleet, for instance. ↑ "Oxford Dictionaries - Dictionary, Thesaurus, & Grammar". askoxford.com. ↑ "A menagerie of monikers". The Economist. 7 January 2010. Retrieved 9 July 2011. 1 2 Reischauer, Edwin and John K Fairbank, East Asia: The Great Tradition, 1960. ↑ Robert Sewell (1901). A Forgotten Empire: Vijayanagar; A Contribution to the History of India. ↑ "Historical documents". Department of Foreign Affairs and Trade. 1 2 Only includes the area of Far Eastern Federal District. 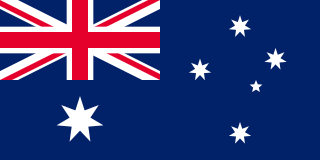 ↑ Christmas Island is an External Territory of Australia. 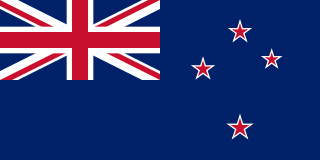 ↑ The Cocos (Keeling) Islands are an External Territory of Australia. ↑ "Law of the People's Republic of China on the Standard Spoken and Written Chinese Language (Order of the President No.37)". Chinese Government. 31 October 2000. Retrieved 21 June 2013. For purposes of this Law, the standard spoken and written Chinese language means Putonghua (a common speech with pronunciation based on the Beijing dialect) and the standardized Chinese characters. ↑ No specific variety of Chinese is official in the territory. Residents predominantly speak Cantonese, the de facto regional standard. ↑ Japan's National Diet have not officially enacted a law stating that the official language is Japanese. Greater China is an informal term used to refer a geographic area that shares commercial and cultural ties - for instance Chinese-language television, film and music entertainment. 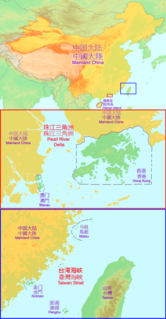 The precise area is not always entirely clear, but normally encompasses mainland China, Hong Kong, Macau, and Taiwan - with Singapore sometimes included. 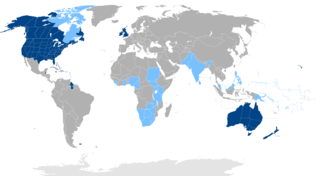 A de facto embassy is an office or organisation that serves de facto as an embassy in the absence of normal or official diplomatic relations among countries, usually to represent nations which lack full diplomatic recognition, regions or dependencies of countries, or territories over which sovereignty is disputed. In some cases, diplomatic immunity and extraterritoriality may be granted. The Asia–Pacific and Middle East Region is a region that competes in the Little League World Series. Asian teams first competed in the LLWS in 1961, when Japanese teams competed in the original Pacific Region. In 1962, Japanese teams began competing in the newly created Far East Region. Jurubaça was a term for interpreter in the Portuguese colonies of Southeast Asian and the Far East, particularly in Macau. The term is prevalent in mid-sixteenth through eighteenth-century documents. According to the Grande Dicionário da Língua Portuguesa, a Jurubaça was an “Antigo intérprete da Malásia e do Extremo Oriente,” an ancient interpreter in Malaysia and the Far East. The word derives from Malay jurubassa which translates as a person who is an interpreter. The earliest document utilizing the word iurubaças dates from the sixteenth century. Whitaker, Brian (February 23, 2004). "From Turkey to Tibet". The Guardian .